Being a mom of 3 boys I can relate to the endless task of cleaning up toys. It seems that no matter how much I pick up after my kids, within one minute its back to being a mess again. Of course the ideal situation would be to have children that put everything back in its place. As we all know, that’s a pipe dream bestowed upon very few lucky mommies. As with most things, we have to be realistic in our expectations of ourselves and our kids. However, it doesn’t mean that we have to settle for a constant mess. You would think that being in the profession that I am in, my playroom would be an ideal haven at all times. While it may seem more organized than most, it’s not something that is unattainable for the rest of you! As long as there is a system put in place, you can achieve a much more organized playroom – that will also prove to be more enjoyable for your children. For starters, STEP 1 is to always DECLUTTER. Get rid of the toys that your children do not play with. If they are not in use, they are just taking up unnecessary space. Donate what your kids no longer use – it’s a great way to give back. You can also gift the items to local schools, churches, synagogues, or even your friends and family!! Next, STEP 2 is to divide the toys you’re keeping into zones. This is a great for your kids to help you with as well! (don’t hesitate to put them to work and learn the value in being neat and tidy). So the thing with zones, is that they have to suit you and your children’s needs. They should have easy access, and should have a clear understanding of where their toys belong. I have 3 boys, which means my zones are divided in 2 ways. First, the toys are pooled by age. Then, after the toys are pooled by age, divvy them up by category. Cars with cars, superheroes with superheroes, so on and so forth. Now that you have created a giant mess of categorized toys all over your floor, you’ll need a storage system. It doesn’t have to be super expensive or super fancy, but it does have to be efficient and functional. A storage system is anything that helps keep your toys divided with an easy way to access them and recognize them without having to dig in. 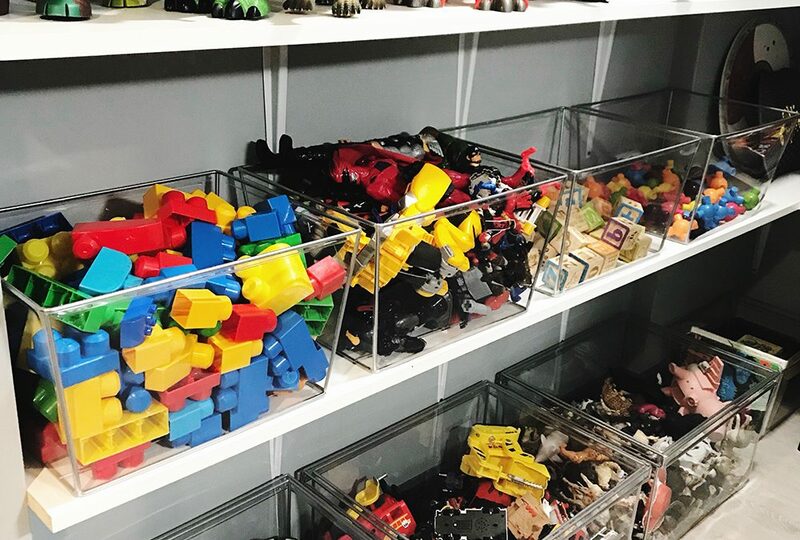 Storage cubes is my first recommendation because they come in all different sizes and provide an easy way to store the toys by category and out of the way. These cubes usually come with their own bins that match by size and shape so you don’t have to do lot of searching. I recommend using clear bins, or any kind of bin that you can see through. These will be great for the kids because they won’t have to shuffle through to see what’s what!. If you are already lucky enough to have a toy closet and storage cubes are not necessary, all you’ll need are the bins! My favorite are the Looker bins (which you can find at The Container Store sells in all different shapes and sizes). The pic above is a project using these exact bins, and the end result was a parents dream! Now that the toys are divvied up and stored, the next thing I suggest is a labeling system. For the kids that don’t read, find a picture that represents the section you labeling, and stick it on the bin (you can tape it, glue it, or use customized labels)! Get creative and have fun with it! This is another thing your kids can help you with!. Aside from picture labels, you can simply use a label maker and print out the labels that way! If a label maker is not your thing, you can go online and find any kind of label that your heart desires! Or you can buy blank ready-made labels and write on them yourself as well! The choices are endless. Last but not least, playrooms usually have more than just toys. Most of the time, there’s also coloring books, puzzles, play-dough, paint, chalkboards, and things like crayons, markers, pencils etc. which should be stored in a separate zones to help feed your child’s imagination!. There are lots of Pinterest-ready ways to get creative and have some fun! Clothes pins, turntables, chalkboard walls, art stations, the options are endless!! At the end of the day, your playroom does not have to be full of chaos – it can be fun and organized all at the same time!